From the outskirts of vil. Elbrus the group rises to the bridge over the Irik River. Here you have a rest. Then along the upper marking path the group ascends to the Narzan springs. Having a rest again the group goes to the glade near “The Sandy Castle”. This place is the end of the route. Don’t go out the pointer “The end of the route”. The descent way is the same as the ascent way. Climbing Mt. Chatkara 3914 m from the pass Irik-Chat 3667 m.
Starting from the village of Elbrus 1800 m (morning, early). The rise in “a hanging valley” of river Irik, the road goes through the pine forest. Out of the woods (about 2200 – 2300 m). The rise in “a hanging valley” r.Irik-Chat (about 2500 m). 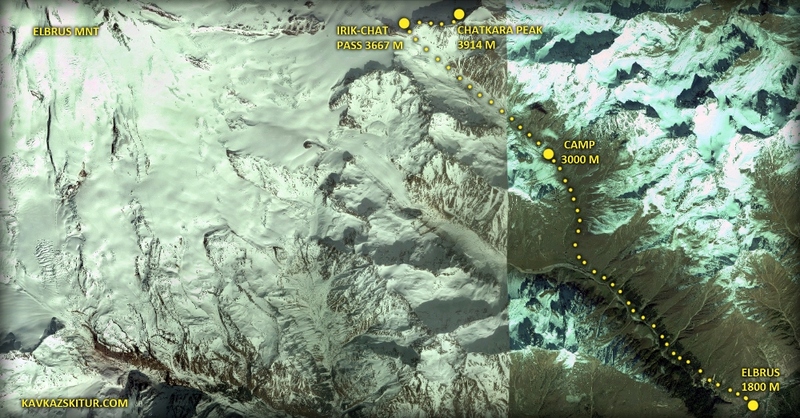 Going to a height of 3000 meters, the installation of camp, overnight. The duration of the transition is about 6-8 hours. Pass Irik-Chat is one of the passes in the closest ring passes around Elbrus, glaciers surround it, flowing directly from the slopes of Elbrus – Irik-Chat on the south side, and a huge ice field Dzhikaugenkez – from the north. The Trek allows, along with the necessary gain of altitude (Chatkara 3914), very seriously to train your legs. Here you will need to walk a lot, though not too hard. There are no steep ascents (perhaps the most hard – the pass, its quite steep but brief), but there are long-distances, the lovers to “walk” in anticipation of the main climb – the mountain – will like the trek. Perhaps your legs will be pretty tired, but the species that are opened from the pass Irik-Chat, and then – from Chatkara, they worth it, and the body at the time of ascent of the Main Mountain then will say thank you for all this. Here Elbrus is very close, visible Achkeryakolsky lava flow – line, on which the ascent of Elbrus from the East. Visible peak Kalitsky, from the pass – a stone’s throw. However, due to the big distances, people who train in the plain from case to case, and either did not exercise or first time in the mountains, should think twice, before choose this trek. If you train hard and quite fierce, in the most regular manner (your anaerobic threshold, or the threshold of anaerobic metabolism in this case will be no lower than 170-180 beats/min in running or walking, and heart rate at rest is not higher than 55-60 beats/min), then you must come here. This trek is not technically hard and does not require special climbing equipment. All that you will need in the hike (and what you will need to take care yourself) is sleeping bag, mat, clothing, personal care products (sunscreen lipstick), sunglasses, headlamp flashlight, personal first aid kit, trekking poles. The total weight of the backpack is unlikely to be more than 10 kg. Camping equipment, its delivery, kitchen, food, cooking – provides by our team forces. 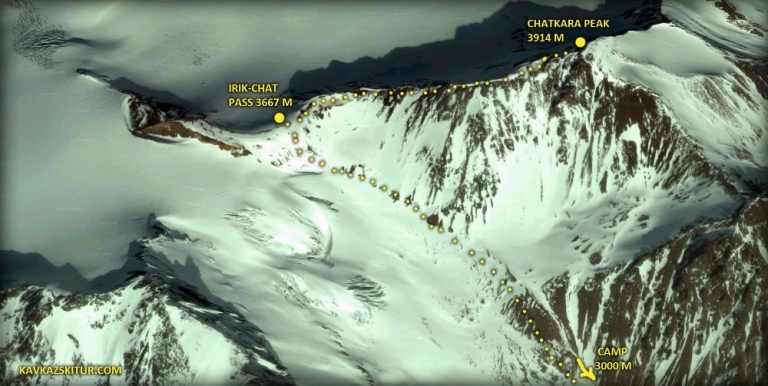 The plan of this day hike to the Irick-chat gorge till the tongue of the glacier (3000 m). The glade of the river Irik is considered as one of most beautiful rivers in the Elbrus region. The river flows out from the glacier with the same name and runs into the Baksan river near the Elbrus vil. The glade is situated between south-east and eastern ridges of Mt. Elbrus. Its level 500 m higher than the Baksan glade. Before the confluence into the Baksan river it flows in a deep canyon, the slopes of which are covered with a pine forest. The route starts on the northern outskirts of the vil. Elbrus (1770 m) near a pier on the left bank of the Irik river. Two paths leave from here. The first one passes by the rocky exits below on the left side of the glade and in 25 min. brings you out to the narzan sources. The second path goes along the herbaceous slopes above the rocky exits to the inclined glade with a spring. The narzan sources are 50m lower, it’s not difficult to go down there. On this part of the route you should be especially attentive, as even a small uncarelessly removed stone on the steep herbaceous slopes can get you into trouble. From the glade it is necessary to mount in a direction of huge fungoids with yellow sandstone. Steep screes are replaced by slopes, grown with a century pine forest, above which as a white cupola raises the Mt.Elbrus. As the theatrical sceneries appear snow-white summits – Djan-Tugan (4012m), Ullukara (4302m), Bgeduh (4163m), the Eastern Ushba (4697m) etc. The path traverses the slope of the glade and enters a pine forest. Here there are a lot of mushrooms and berries. Having passed the glade with the coshi, the tourists intercept some gullies and descend to the Irik river. In 3,5 hours from the village they reach the edge of the forest (2250m). On the background of Mt. Elbrus the glacier Irik is seen. Continue the rout to the upper reaches of the Irik river. Over the path of the left bank it is necessary to leave to the coshi, located above a coalescence of the Irik River with the left influx Irik-Chat, then cross over the bridge to the right bank of the Irikchat. On the flat glade grown with grass, by the coalescence of both rivers, there are a lot of ground-squirrel holes. The path leads up to the right bank of the river Irik, and then along it – to the tongue of the glacier (3000 m). Here, about an ice cave, from which the river outflows, the path ends. Early rise (at dawn), breakfast, light output. The rise to the pass Irik-Chat 3667 m (about 2 – 3 hours). The rise to the Mt. Chatkara 3914 meters (from the pass – one hour) along the western ridge (1B, sometimes guessed trek). Descent to the camp through the ascent route (2-3 hours). Lunch. 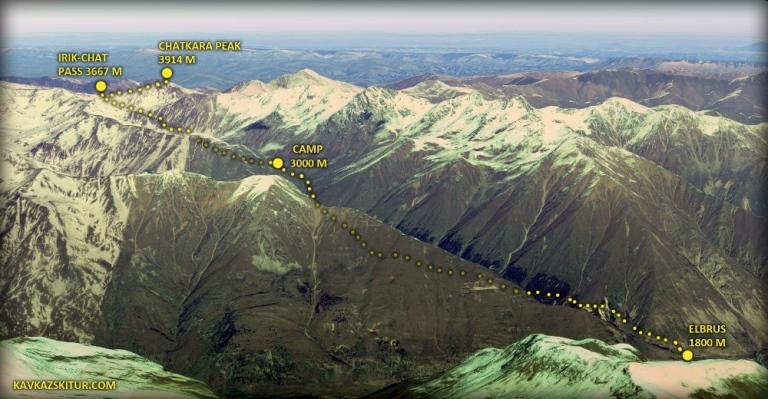 Gathering camp, descent to the village Elbrus (4-5 hours), transfer to hotel. Camp at 3000 m – cozy glade near the river and source of spring water with a small creek. The glade is located at the upper boundary of alpine meadows of the canyon, if continue along the path already begin stones. On all route to this place – very comfortable, well-trodden path that allows trained people to keep very good speed of movement. 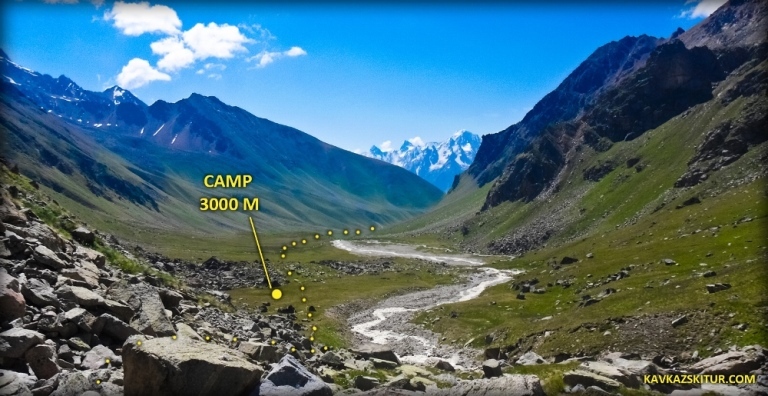 From the 3000 m camp to the pass and on the pass – the path a little less comfortable, due to the rocky “cover” and periodically small ups, but also readable and stuffed. The way on the ridge to the top of Chatkara is not also too much difficult. Shoes – trekking, comfortable, mobile. Crampons not needed.